This article was written by University of Northern Colorado Associate Head Men's Coach Steve Smiley. I am really excited to talk a little bit about our defensive philosophy and system here at the University of Northern Colorado. This article is going to breakdown our sets of “5” on defense that we focus on as a program. Our staff (led by Head Coach Jeff Linder) just completed our first season at UNC, and during our first year and as we move forward, we know that a big determining factor of our success each year will be determined by how well we defend and rebound. We spend a lot of time daily in practice to build the habits that will translate to a successful defensive team. We also spend a lot of time in the film room with our players on an individual basis (our three assistants each have five players that we are responsible for cutting film for during practices and games), and we chart and rate multiple categories in both practice and games (more on this later). Scouting of upcoming opponents is also of utmost importance in our program, and I believe that we subscribe to Billy Donovan’s ratio of 80:20: 80% of what we do in each game defensively is built upon our system and philosophy, whereas 20% of what we do is built on scouting and attempting to take away our opponent’s strengths. I think that is an excellent ratio for coaches at any level. As a coach, you never want to be so stubborn in your system that you do not make adjustments for each opponent, but (in my opinion) you also do not want to be a coach that has no core to your defense and tries to adjust and game-plan differently for each opponent. There must be a core to what your team does on the defensive end. I heard recently on a podcast with Jeff Bzdelik that in the past 10 NBA Finals, 17 of those 20 teams that made the finals were Top 10 in the NBA on both the offensive AND defensive end of the floor. Success is hard to come by if your team is not committed to getting stops. In the five previous seasons, before we arrived, UNC had teams with the following defensive efficiency ranks in KenPom (out of 351 D1 teams): 330, 305, 336, 349, and 348 for an average of 334. During our first season last year, we jumped up to #218, a leap of 130 spots from the previous year’s, finished #2 in the Big Sky, finished #32 in the nation in Opponent Offensive Rebound %, and had a freshman that was named Defensive Player of the Year. As our team gets older, more mature physically and mentally, and we get more size and length on the floor, our goal is to make another big leap in the coming year(s). Rule #1 is as simple as it gets. 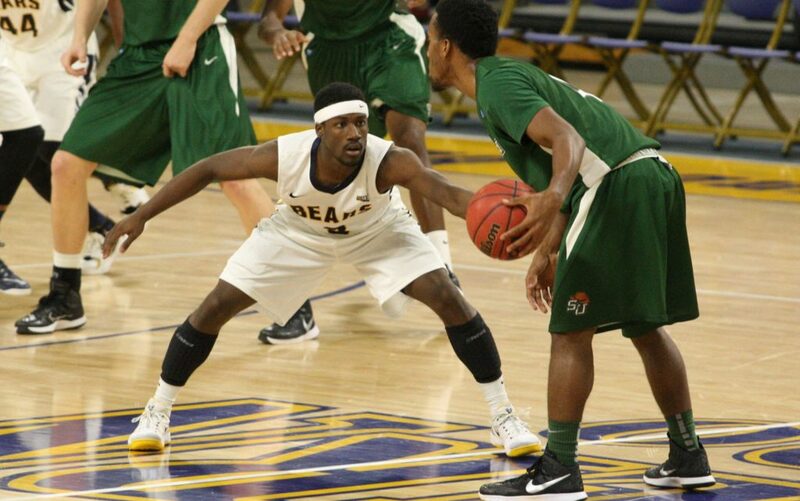 To be a great defense, players must be willing to make multiple efforts. It is not enough to closeout and contest a shot, and then forget to turn and sprint two steps to get the rebound. We must constantly make multiple efforts if our defense is going to be elite. We rate the opposing team’s perimeter players in 1 of 3 categories (Sniper, Player, Driver). For any “Sniper,” our goal is to allow no 3pt attempts. If we’re guarding a great shooter that is 44% from 3 and attempts 8 of those 3’s per game, if we can limit that shooter to 2 attempts, we are in business! A lot of teams make a rule of no paint, which is a good idea. We have adjusted our thinking to condense that area into what we call “The House.” The House is basically a foot outside of each FT lane line, and 1 foot above the 1st hash. We’ll tape down a blue box for our house in each practice, and a lot of our drills are built to keep the ball from getting into The House. Our reasoning is that we absolutely cannot give up layups, as layups are one of the highest % shots in basketball (along with open 3’s and Free Throws). We believe that every shot must be contested, whether it is a 3, pull-up, lay-up, hook from the post, etc. Our basic rule is that we leave the floor to contest when the opposing offensive player leaves the floor for the shot, NEVER before. We work on closeouts every day and attempt to build the habits in our players to only leave the floor after the shooter is in the air. This goes to our Defensive Rebound Coverage, and we spend more time on rebounding than probably any other area of the game. It does us no good to guard for 28 seconds for a tough, contested 2 (the shot we want our opponent to take), and then give up an offensive rebound. O-Boards are one of the most demoralizing pieces of the game, so we drill, and drill, and drill our players to become a great defensive rebounding team. We will add in many other components to our defensive package during each practice, but these are the five areas that we work on every single day. (1) Check (to see if your man is crashing on every shot). (2) If they don’t crash, get to the action. (3) If they are crashing, confront, and do not allow them to get 50-50 or around you. (4) Pursue with hands ready. (5) Squeeze every rebound with two hands. (1) Understand your role on every shot → Are you a “Crash” or “Get-Back” guy? (2) Everybody = 3 sprint steps (on the release for our Get-Back guys, on the Defensive rebound for our Crash guys), turn and find the ball. (3) Talk and Point (4) Top guard must declare the ball; other players must build walls in the gaps. (5) No 3’s (they almost always happen within the first two passes of transition). (1) Understand your opponent and the distance of your closeout (Are you guarding a Sniper, Player, or Driver? This determines the distance of the closeout). (2) Closeout with the proper angle → Our defense is built so that we cannot get beat to the outside (to the baseline). (3) Have a “Stick-Hand” on the closeout → One hand extended, above the ball. (4) Be ready to take the jab (release and a small step back on any attacking move). (5) On any shot, we leave the floor after the opposing player leaves the floor for his shot, but not sooner. We land, and then take two hard steps towards the basket for the defensive rebound. (1) Always have a Stick-Hand to discourage the raise-up 3. (2) Do not get beat to the outside (baseline). (3) Hands off, do not foul! (4) Do not let the ball in The House. (5) The first dribble is the most important; we cannot get beat on the first dribble. (1) As soon as you hear the screen being called, push-up (eliminate space) into the handler and force into the screen. (2) Never get refused on a ball-screen. Must force the handler into the screen. (3) Always defeat the screen (go over) unless the scouting report is to go under the screen (the handler is a Driver). (4) Defeat the screen with high, active hands to discourage the snap-back pass. (5) Get back in front of the handler as quickly as possible so that the screen defender can get back to his man as quickly as possible. This takes maximum effort. A Bubble is placed in the hoop to ensure the miss. 3 Offensive Rebounders at the 2 blocks and top of key. 2 coaches on the wings. Coaches skip the ball to each other until one coach decides to shoot. On the shot, it’s 5 defensive rebounders vs. 3 offensive rebounders. 1 point for a defensive rebound, 2 for an offensive rebound. Go for 1-2 minutes, then flip the teams and repeat. 5 defensive players (preparing for transition) circle up around the free throw line. Offensive point guard is at the top of the key, two wings are stretched out to the coaches box on both sides, and two offensive bigs are at the dunk spots. Coach has the ball under the hoop, points to the PG which direction to go to (right or left). On whistle blow, PG sprints to that side for a deep outlet with all other players exploding in transition. Our goal on defense is to slow the ball, and not give up an open shot in the first two passes. The offense is at two wings, top, and a big on the near-side block (if the coach is on the left baseline, offensive big is on left block). The defensive post is on the floor playing high-side with an arm across. Three other defenders are lined up across the baseline. Coach throws the ball to the nearest defensive player (nearside corner), who throws the ball to the defender on baseline underneath the hoop. As soon as he passes, he is sprinting to an offensive player on the opposite wing for the first closeout. Next pass goes from middle defender to the far side defender (still on the baseline). After his pass, the middle defender is closing out to the gap (not the player) of the man at the top of the key. The third defender gets the catch, passes it to the near side offensive wing player, and has to sprint to closeout to the opposite elbow (guarding the player on the opposite wing). Offense moves the ball around from wing to top to the opposite wing, and then the play is live. Play for 15 seconds, and put restrictions, such as the ball cannot get into The House, etc. Once the coach makes the initial pass, the ball must move quickly from player to player. This is a high-speed, high-intensity drill. Players have to talk the entire time, closeout to proper areas, closeout to their player with the Stick-Hand, etc., or the whistle immediately blows the play dead, and that team is off. One point is awarded for a defensive stop. Stay on defense if you get a stop, and continue. If a team gets 3 stops in a row, we call that a KILL, and we award 5 bonus points. Play for a set amount of time, and losers run. This drill is very basic, can play with guards on one end, bigs on the other end. Each inning is comprised of 3 outs (defensive stops). Play through the rebound (have to get a rebound to finish the play and get the Out). Coach decides how to start the 1v1 (location, if it starts with a closeout, or from live dribble, etc.). The basics of our Ball Screen Defense. We’ll play 2v2 to start with CE (Corner Empty). For instance, Coach has a ball on the right wing; offensive big is at the top spot (defense starts in the gap in proper position). The offensive guard is at the other wing spot (defensive is in the appropriate gap). Coach swings the ball to the big, who swings the ball to the guard, and sprints into a basic wing ball-screen. We play live from there (offensive big can pop or roll). We will then go into a 3v3 drill with the same alignment except we add an offensive guard to the same corner (CF means Corner Fill), and then play strong-side ball-screen coverage with the big rolling, and the defender is guarding the corner being the Tag Man. What we usually do is rotate teams from Offense to Defense for a set amount of time. Based on how we are going to guard the other team, we chart every scout mistake. This year, we averaged 8.2 Scout mistakes per game and gave up 13.2 points per game on those mistakes. Each player is expected to grade out on rebounding effort at a minimum of 80% in each game and practice. We chart every player on every rebound for both offense and defense. For the sake of this being a defensive article, the player gets a “Yes” if he checks his opponent on each shot, and then if that opponent crashes, he confronts the opponent and pursues the rebound. If our player just turns and goes to the rim on the shot, without checking, he gets a “No.” This is a bit of a simplified explanation, but the point is that we check every rebound for our players and then show film to them as well. Our players have to average 80% or more (do the right thing at least 4 out of every 5 rebound attempts). After every game, we chart how many points we gave up in Transition (in 2015-16, we gave up an average of 11.5 points per game, 1.5 over our goal of 10 or fewer points per game). This is an Advanced Stat that we took a lot of pride in this year. Opposing Team’s Offensive Rebounding % against us was 25.4%, so our Defensive Rebound % is basically 74.6%, which was good for #32 in the nation. It’s a great measurable for us based on how much we emphasize rebounding in practice. This is a stat I look at a lot when preparing scouting reports. I use this a lot more than the basics of PPG, etc. For instance, if an opponent is scoring a lot, but their O-rating is 85.6 (which is bad), we know that we just need to force that player into the shots we want him to take, and he will probably take them, which will help us out. Conversely, if an opponent only averages 9 PPG but has an extremely high rating of 115.2, we have to be on high alert when he is in the game. Maybe he only averages 9 because his minutes are sporadic, but he is a highly efficient offensive player, so we have got to know where he is at when in the game, and plan our scout accordingly. There are a lot of different ways that you can hold your defense accountable, but we believe that we have found a good system here at the University of Northern Colorado. Our goal is to continually be improving our defense through accountability, hard work, and the tracking of stats. Hopefully, you can find some great ways to help your team defense to improve from this article. 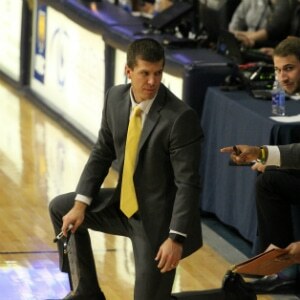 Steve Smiley joined the University of Northern Colorado coaching staff in 2016. Before joining the Bears, he was a part of the Weber State program and prior to that he was the head coach at Sheridan College for 6 years.